Earth and Moon seen from nearly a billion miles away! 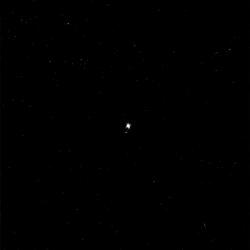 Earth and Moon: Does this make my planet look small? (enlarge photo by clicking on it - then you'll see the Moon, too. )Courtesy NASA/JPL/Space Science Institute During the Apollo lunar missions in the late 60s and early 70s, many of the astronauts remarked at how small Earth seemed from the Moon. On this anniversary of his first steps on the lunar surface, I wonder what Neil Armstrong would have thought of this remarkable photograph taken yesterday by the Cassini spacecraft? In the center of a field of stars sits planet Earth and the Moon taken from more than 898,000,000 miles away!